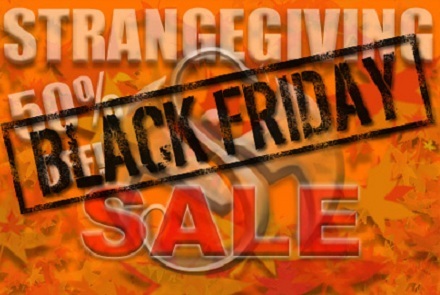 Black Friday – Shop The Strangegiving 50% Off Sale! The feast might be over, but the Strangegiving 50% off sale sure isn’t! Why interrupt that turkey-induced coma by fighting off hordes of crazy people at a shopping mall when you can just pick up the latest Strange Music gear at half off right from the comfort of your own home? From t-shirts to posters to the dopest accessories, head over to strangemusicinc.net now for some great deals. So skip the hassle and shop Black Friday with Strange Music’s Strangegiving Sale – now in effect! CLICK HERE TO SHOP OUR BLACK FRIDAY STRANGEGIVING SALE!